Shirdi Sai Baba devotee Lavanya Nagrajan from India says: Om Sai Ram, I thank the team members of the Mahaparayan group for their commendable job. My name is Lavanya living in Chennai India. Iam worshipping Sai since 2015. I have experienced lot of His leelas. I want to share one of my experience in this group. The year 2016 was quite painful for me. I have a daughter studying in 11th standard. I was working as a professor and Head in Vels University. Due to some reasons I left my job in the month of April and was searching for another job. During that time I prayed to Sai daily and read Satcharitra Sapthah. I used to go for aarti on every Thursdays in Mylapore temple. Meanwhile I got a job in another college but it lasted for 2 days. I prayed to Sai for the job. 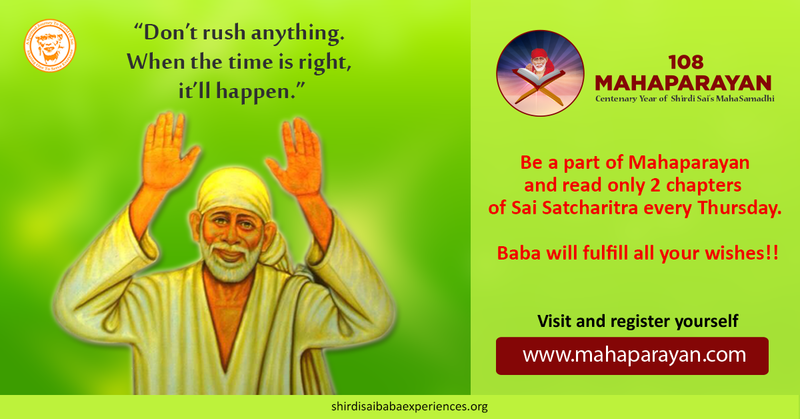 I asked Sai to give me a job with the salary of 30,000 per month to meet my family expenses. During my prayer I heard a voice that I will give you double the amount of 30,000. I went on searching. Whenever I did Saptah parayan I got interview call but because of my over qualification they rejected me . I even tried in schools also but all in vain, but I didn't leave Sai. During my saptah reading an advertisement for the Assistant professor for a Government College in Chennai came. I applied and waited for the interview. Call letter came for attending the interview.I knew about the college and I also knew that the post would be given only to those who worked already in the consolidated pay. I made my mind that I should attend the interview. I didn't pray to Baba to give me the job instead I just prayed Baba to please make me to do well in the Interview as I knew that they would give only to their staff. I attended the interview and more than 15 members were present for 2 posts. 15 candidates including me from outside and 3 from the same college. My turn came and I answered all the questions boldly. After returning home I thanked Baba for my performance in the interview that night before I went to the bed. I told Baba that He knew about my family situation that I was searching for it. Then He alone could talk to the Board members before the selection of the candidate. While I was praying like this I heard the voice "Already I spoke to them. I couldn't believe this”. After the 5th day of my interview I got a message from the college that I should join the next day with my fitness certificate. I was very happy that I got the job that too in a Government college. Tears were rolling in my eyes. When I was about to leave for Aarti I got the message. Soon I rushed to the sweet stall and bought dry Jamun for Him and when I entered the temple Naivaidya had been done to Baba and aarti was about to start. I gave the sweet to them to offer it to Sai and they kept it down. I felt very glad in a minute the Shastri who was performing the pooja took my jamun only and not any other food, really I cannot tell you how much joy I experienced. On 17.10.2016 Baba only made me to join as the first person in our group and totally 22 were appointed for the different subject. After a year passed we didn't get the qualification approval from the University. After a month my colleagues got their approval but I didn't get as they didn’t give because of the equivalent which I didn’t get from the University since I did Ph.D from VIT, Vellore. To get equivalent I applied to the concerned department HOD. Instead of denying she wrote that university authorities had to take the decision. My file went to VC office in the month of May 2018. I thought now my government job would be out of my hand. But Baba was with me. During these days I saw the experiences of Sai blog and I read devotees’ experience. After reading that I prayed Baba if I got approval then I would share my experience. Using the link i joined Mahaparayan group and was waiting to be a member of that group. Meanwhile I went to Shirdi. When I was in Shirdi VC was looking in to my file and asked clarification in the concerned section. Also for the Mahaparayan nearly after 4 months I got a call from the team to get my concern. I accepted as soon as I gave my acceptance and was about to start my parayan that the University clerk called me and told no equivalency was needed for the VIT university. I thanked Sai. After started reading for Mahaparayan, Approval section clerk called me and told that they would send the qualification of approval next. week. During the third week of my Mahaparayan I got the letter. I thanked Baba for His support. Exactly after two years of joining the college I got the approval letter. I offered sweets to Baba. All these days I prayed Sai. I used to take His darshan and did Aarti daily. Now my file has been to collegiate education office. There it has been kept pending, whenever I have to face any problem Baba assured me through these words "Do not fear I am with you". Baba is always with me through His words. This week also I completed reading Satcharitra Saptah. Now I am waiting for my salary which Baba told me double the amount that I had asked for 30,000. I thank the team members for providing me the opportunity to share my experience. Now I am a part of Mahaparayan and I am the class teacher of MP-375. When we completely trust Sai and surrender to Him wholeheartedly He too fulfills all our desires keeping in mind our welfare. Nothing is impossible for Him. Let’s also get in service of His job to serve where the salary would be love and countless blessings. Love You Deva. Jai Jai Ho Sai.